Join the T-Club, our social group for those aged 50 and over, for a special treat in Dial House Café. This is a fully accessible meeting space. 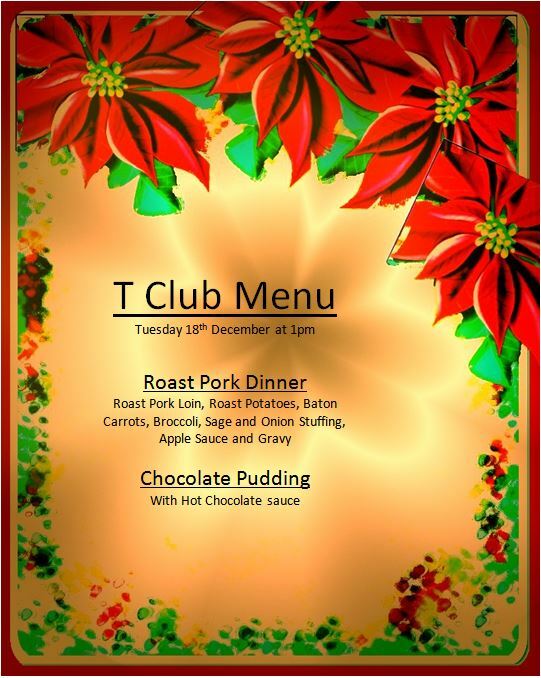 By special request of club members, the Dial House Café is delighted to put on a special Christmas Roast Dinner for the T-Club on Tuesday, 18 December starting at 1pm. On the menu will be Roast Pork Loin, Roast Potatoes, Baton Carrots, Broccoli, Sage and Onion Stuffing, Apple Sauce and Gravy followed by Chocolate Pudding with Hot Chocolate sauce. The afternoon will include a Seasonal Quiz and games. The fee for the afternoon is £5, payable on booking. The booking sheets are at Dial House reception, so you had better get your name down fast. Booking is essential. Call 01244 345655 for more details and to book your place.